This engagement ring features beautiful aquamarine gemstones and diamonds, creating a look that fits this antique-style aquamarine and diamond three stone engagement ring! Situated on a 14K yellow gold band, the center stone is an authentic A rated, round cut glacial blue aquamarine, 4mm in size, while the two diamonds on either size total 0.50 carats. On each side of those round cut diamonds lie three more round cut diamonds, totaling 0.14 carats. All of the diamonds in the ring are H-I for color and SI for clarity. 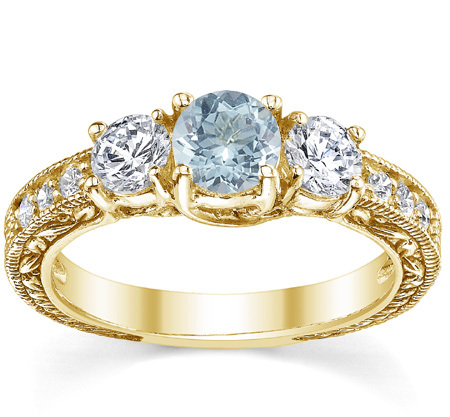 Apples of Gold Jewelry offers this stunning aquamarine engagement ring that will make every day special! We guarantee our Antique-Style Aquamrine and Diamond Three Stone Engagement Ring, 14K Yellow Gold to be high quality, authentic jewelry, as described above.